Nizhny Novgorod. Instituted on August 16, 1781, re-instituted on October 15, 1992. Ardatov. Instituted on August 16, 1781. 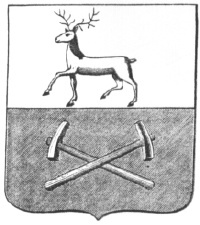 Arzamas. Instituted on August 16, 1781. Balakhna. Instituted on August 16, 1781. Bor. Instituted on June 27, 1979. The authors of Bor blazon are B. Bryzgalkin and V. Melnikov. Gorbatov. Instituted on August 16, 1781. Gorodets. Instituted on June 27, 1984. The author of Gorodets blazon is the artist N.I. Lobanov. Knyaginino. Instituted on August 16, 1781. Kstovo. Instituted on September 15, 1983. The author of Kstovo blazon is A.N. Razin. Kurmysh. Instituted on December 22, 1780. Lukoyanov. Instituted on August 16, 1781. Makarievo. Instituted on August 16, 1781. Perevoz. Instituted on August 16, 1781. Pervomaisk. Instituted in July, 1981. Pochinki. Instituted on August 16, 1781. Semenov. Instituted on August 16, 1781. Sergach. Instituted on August 16, 1781. Varnavino (Varnavin). Instituted on March 29, 1779. Vasilsursk (Vasil). Instituted on August 16, 1781. Vetluga. Instituted on March 29, 1779. Vyksa. Instituted on July 10, 1984. The author of Vyksa blazon is A.A. Seppius. Zavolzhie. Instituted on August 6, 1984. The author of Zavolzhie blazon is V.A. Goryachev.